Our tour of the West Coast takes us along the R27 next to the Atlantic Ocean past Bloubergstrand, Melkbosstrand and on to The Strandloper Restaurant in Langebaan on the beach under fishing nets. After a delectable hearty sea food lunch we off to tour the West Coast national Park surrounding Saldanha Bay, proclaimed in 1985 – known for its bird life and spring flowers – wildlife in the park including large antelope such as Eland, Red Hartebeest, Bontebok, Kudu, Gemsbok, Steenbok, Mountain Zebra and Duiker and Ostriches in the Postberg area. 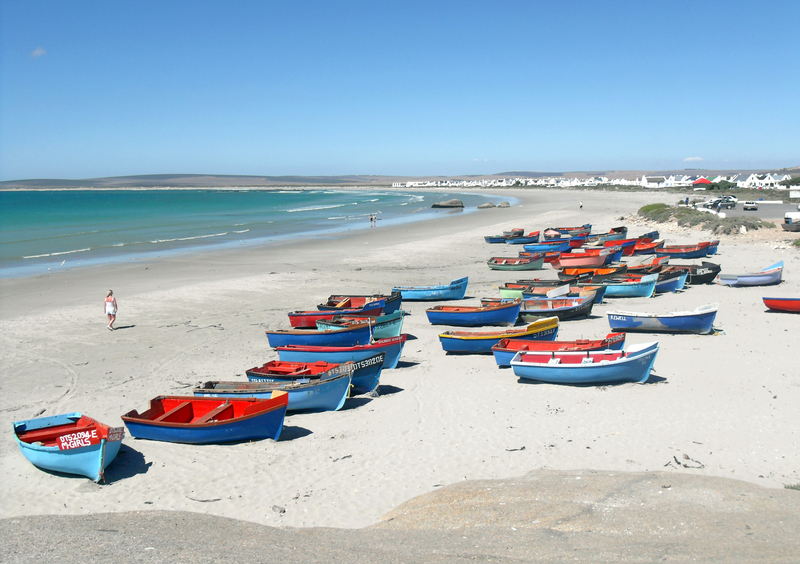 Our tour then moves on to Paternoster for the night or two in one of the oldest fishing villages on the West coast of S. Africa, situated 15 km`s north-west of Vredenburg and 145 km`s north of Cape Town at Cape Columbine – a sought after tourist destination famous for their Lobster and white washed fishermans cottages. The jagged cliffs and white boulders makes this one of the most beautiful beaches on the west coast of S. Africa and includes whale, dolphin, seal and penguin watching as well as 225 various bird species, finally we move on to St. Helena Bay for sightseeing and to further explore where the Portuguese explorer Vasco Da Gama first set foot in S. Africa on the 7 th November 1497 and where the first battle between Europeans and the indigenous Khoikoi took place and is now a major fishing village with 11 processing factories – The Tour includes (lunch at the Strandloper Restaurant), followed by tour of the West Coast National Park around Langebaan Lagoon and then on to Paternoster where a 1 or 2 night overnight stay is optional, finally moving on to St. Helena Bay for cocktails and sundowners before returning to Cape Town.